Original Editors - Sarah Carlisle & Jill Thompson from Bellarmine University's Pathophysiology of Complex Patient Problems project. Chronic Fatigue Syndrome (CFS) is a debilitating and complex disorder that is not a single disease but the result of a combination of factors and is a subset of chronic fatigue. This is characterized by intense fatigue that is not improved by bed rest and that may be worsened by physical activity or mental exertion. This unexplained fatigue must last at least 6 consecutive months, must significantly interfere with daily activities/work, and the individual must concurrently demonstrate 4 or more of 8 specific symptoms. There has been some difficulty in exactly defining CFS due to its very nature, and there have been multiple studies attempt to develop and finalize diagnostic criteria for CFS. 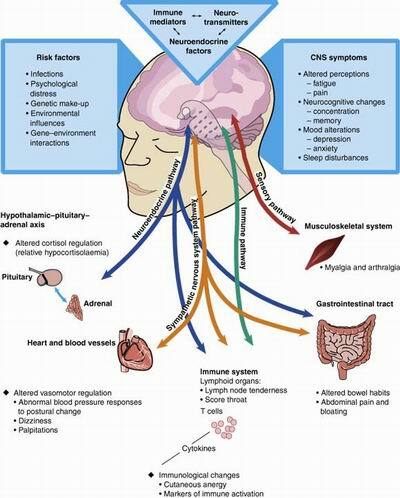 A Cochrane Review done in 2016 described CFS as an illness characterized by persistent, medically unexplained fatigue [with] symptoms that include severe, disabling fatigue, as well as musculoskeletal pain, sleep disturbance, headaches, and impaired concentration and short-term memory. CFS over the years has been known by various names such as chronic fatigue and immune dysfunction syndrome, chronic Epstein-Barr virus, myalgic encephalomyelitis, neuromyasthenia, as well as the, “yuppie flu”. CFS is characterized with overlapping symptoms (about 70%) with Fibromyalgia that have some biologic denominator. Reported prevalence is dependent on which definition/diagnostic criteria used, the type of population that was surveyed, and the study methods of the research being referenced. The Cochrane Review of 2016 reported estimates that between 2 in 1000 and 2 in 100 adults in the USA are affected by CFS. Whereas other Goodman et all report studies finding prevalence among adults to be between 0.23% and 0.42% with higher incidence in women, minority groups, and people with lower educational attainment and occupational status. First, other common conditions should be ruled out prior to diagnosis. See Differential Diagnosis section for details. Systematic Reviews have shown effectiveness and benefits with cognitive behavior therapy and graded exercise therapy. Roberts found that individuals with hypocortisolism and CFS do not respond as well as others after 12-15 sessions of CBT. The study questions if these individuals require a longer duration of CBT, a modified version, or a combination of therapies including hydrocortisone replacement therapy. Further studies are necessary in order to address these questions. See Physical Therapy Management for information regarding combination of GET and CBT. For more information on the benefits of yoga for individuals with CFS, see Physical Therapy Management. Fibromyalgia: Patients with Fibromyalgia usually present with increased pain, while patients with CFS experience greater fatigue. 39-year-old female, previously healthy, developed mononucleosis with typical symptoms and findings. Lab tests were diagnostic of Epstein-Barr virus (EBV). Fatigue worsened, was not relieved by rest, and eventually was so severe that the patient became bedridden and unable to work. Chronic fatigue syndrome was diagnosed at one clinic and later confirmed at another. While levels of complement split products were elevated, the patient remained chronically and severely fatigued. Once compliment split products normalized, the patient had complete resolution of symptoms of CFS and returned to work. 35 year old female presents to your clinic complaining of fatigue that started 8-months ago and has gotten progressively worse. Sleeps really well on the weekends, but typically gets less than 7 hours of sleep throughout the week. Regardless of the hours of sleep she gets, she never wakes up feeling refreshed. She reports being too tired to exercise. Although she has a strong network of family and friends, she does not have energy for socializing. She ends up being referred for Cognitive Behavioral Therapy (CBT) and is scheduled to return in 4-weeks. 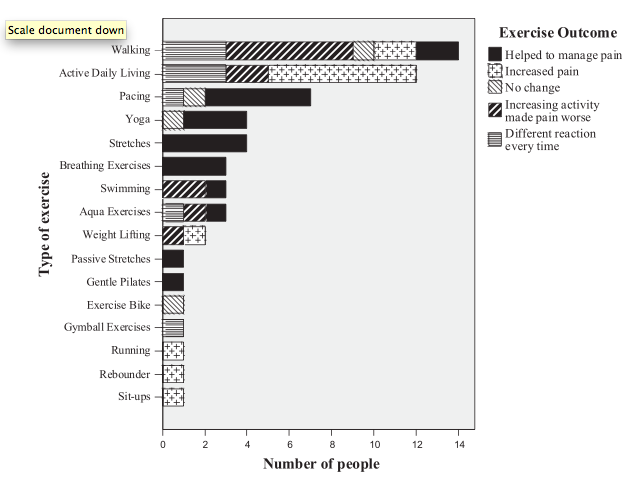 Patient implements healthy lifestyle changes recommended by healthcare providers to sleep greater than 7 hours each night and eat a healthy diet. Patient also started a walking program, eventually reaching 3 hours of walking each week. 4-weeks after lifestyle changes, she implements a weekly resistance training program. Patient intentionally increased her social activities. 6-months after initial visit, patient reports significant improvement although she is still fatigued more easily than most people. 16 year old female diagnosed with chronic fatigue syndrome. After being diagnosed, some of her early experiences and critical incidents were noted to lead to assumptions and general beliefs of herself. These general beliefs showed evidence of triggers that caused changes in her thoughts, feelings, and behaviors. Unhelpful and helpful coping strategies were noted. These different characteristics were considered when creating a plan of care with Cognitive Behavioral Therapy (CBT). Based on this study, CBT may be useful when working with young people with chronic fatigue syndrome and mood difficulties. See study for more specific details regarding evaluation methods and plan of care. Jennifer Brea shares her experience with chronic fatigue syndrome from the beginning of her symptoms, through the journey of being diagnosed, to the life she now lives with her condition. ↑ 1.00 1.01 1.02 1.03 1.04 1.05 1.06 1.07 1.08 1.09 1.10 1.11 1.12 1.13 1.14 1.15 1.16 1.17 1.18 1.19 1.20 1.21 1.22 1.23 1.24 1.25 1.26 1.27 1.28 1.29 1.30 1.31 1.32 1.33 1.34 1.35 1.36 1.37 1.38 1.39 1.40 1.41 1.42 1.43 1.44 1.45 1.46 1.47 1.48 1.49 1.50 1.51 1.52 1.53 1.54 1.55 1.56 1.57 1.58 1.59 Goodman CC., Fuller KS. Pathology: implications for the physical therapist. 4th ed. St. Louis: Saunders; 2015. ↑ 2.0 2.1 2.2 2.3 2.4 2.5 2.6 2.7 Haney, E. et al. Diagnostic Methods for Myalgic Encephalomyelitis/Chronic Fatigue Syndrome: A Systematic Review for a National Institutes of Health Pathways to Prevention Workshop. Annals of Internal Medicine. June 2015:162(12), 834-841. ↑ 4.0 4.1 4.2 4.3 4.4 Goodman C, Snyder T. Differential Diagnosis for Physical Therapists Screening for Referral. 5th ed. St. Louis, MO: Elsevier Inc; 2013. ↑ 5.00 5.01 5.02 5.03 5.04 5.05 5.06 5.07 5.08 5.09 5.10 5.11 5.12 5.13 5.14 5.15 5.16 5.17 5.18 Marshall, R BSc (HONS), Paul, L PhD, Wood, L PhD. 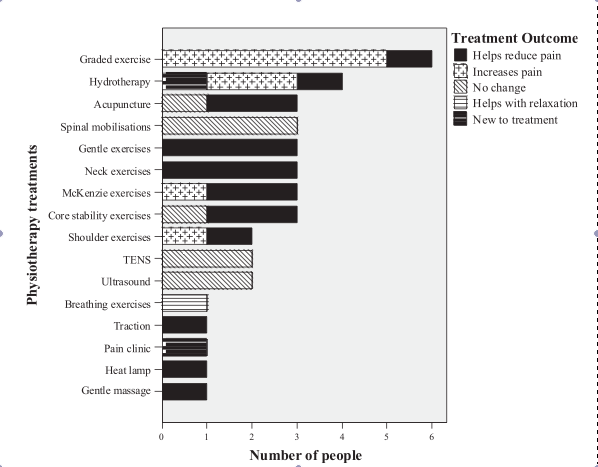 The search for pain relief in people with chronic fatigue syndrome: a descriptive study. Physiotherapy Theory and Practice. 2011:27(5);373-383. Available from: PubMed. ↑ 6.0 6.1 6.2 6.3 6.4 6.5 Teitel AD MD MBA, Zieve D MD MHA. Chronic fatigue syndrome. PubMed Health: A.D.A.M. Medical Encyclopedia. 2012. Available from: PubMed. ↑ 8.00 8.01 8.02 8.03 8.04 8.05 8.06 8.07 8.08 8.09 8.10 8.11 8.12 8.13 8.14 8.15 8.16 8.17 8.18 8.19 8.20 8.21 8.22 8.23 8.24 8.25 8.26 8.27 Committee on the Diagnostic Criteria for Myalgic Encephalomyelitis/Chronic Fatigue Syndrome; Board on the Health of Select Populations; Institute of Medicine. Beyond Myalgic Encephalomyelitis/Chronic Fatigue Syndrome:Redefining an Illness Washington,DC: National Academies Press (US); 2015 Feb 10. ↑ 9.0 9.1 9.2 9.3 Anderson, G. et al. Biological phenotypes underpin the physio-somatic symptoms of somatization, depression, and chronic fatigue syndrome. Aeta Psychiatrica Scandinavica. 2014:83-97. ↑ 10.0 10.1 10.2 10.3 10.4 10.5 Snell, C. R. et al. Discriminative Validity of Metabolic and Workload Measurements for Identifying People with Chronic Fatigue Syndrome. Physical Therapy Journal. November 2013:93, 1484-1492.